A butterfly-shaped gland, the thyroid rests at the base of your neck, just below your voice box. It secretes about a teaspoon of hormones per year, including two main hormones: T4 and T3. The T3 and T4 are synthesized from iodine and the amino acid, tyrosine. Iodine ions from food are absorbed in the digestive tract and are delivered to the thyroid gland via the bloodstream. The molecules of T3 and T4 diffuse from the thyroid gland into the blood and are transported to nearly every cell in your body. Relatively speaking, the thyroid produces large amounts of T4; however, only T3 can be utilized by the body, and it is T3 that has a significant metabolic effect. 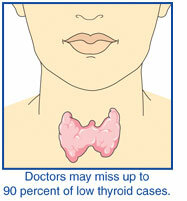 Twenty seven million Americans have thyroid concerns with women representing the majority of these cases. What kind of concerns? Preliminary studies have found a relationship between chemical sensitivities and thyroid concerns including the excessive use of fluorides, the flavor enhancer, MSG, the sweetener, Aspartame and other synthetic chemicals in our food, air and water. Since the thyroid can be the root cause of so many health problems, it’s important to have yours tested by a health care professional. Your thyroid is one of the hardest working, yet often neglected glands in your system. Give it the attention it deserves, because when it’s working, so are you!